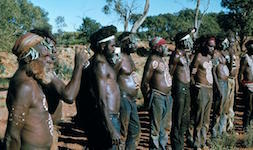 The flame of the Western Desert art movement was lit well before school teacher Geoffrey Bardon arrived in Papunya in 1971, although he is rightly acknowledged for fanning that flame. This story-changing account of the movement’s origins emerges from a major exhibition, Tjungunutja, opening next weekend at the Museum and Art Gallery of the Northern Territory (MAGNT) in Darwin. KIERAN FINNANE reports.